This past Saturday, I woke up with a major hankering for a French pastry. I wasn't exactly sure what I wanted, but I knew that I wanted it to be extremely buttery and so difficult/fussy to make that I hadn't bothered recreating it at home — something like a croissant or an eclair. Eitherway, I frantically woke Erlend up and, despite some initial grumblings from him, we headed out to find me a buttery French pastry. Our first stop was Roman Candle Baking Company, the new hip-and-happening bakery by Stumptown coffee legend Duane Sorenson. I had only been to Roman Candle once before, right when it had first opened up in my neighborhood. Although I was impressed by its beautiful interior complete with dark wood and subway tiles, I had played it safe with a chocolate croissant, which I regretted for several days after. Not because the chocolate croissant wasn't good — believe me, it was — but more that I hadn't been able to get the images of the more beautiful fruit danishes and decadent cannelles out of my mind. These indulgent pastries were what I was after now. Unfortunately, when Erlend and I arrived, there was a line OUTSIDE THE DOOR AND AROUND THE CORNER. For a moment, I was flabbergasted — it was almost like I was back in San Francisco, where it was socially acceptable and routine to wait in line for 30 minutes for a simple morning pastry (cough cough, Tartine Bakery, cough cough). Indignant, I turned to Erlend and snottily huffed: "Whatever. Little T Bakery is down the street. It's better than Roman Candle and I'm sure there won't be a line." Despite Erlend's protests ("Seriously? You don't want to just stand in line? "), I marched him the 10 or so blocks down SE Division to Little T Bakery. My gamble definitely paid off — we were greeted with a beautiful display case filled with the kind of pastries I was looking for, with only 5 or so people in line. As we waited impatiently in line, Erlend and I picked out our breakfast: a baguette filled with brie and salami from Olympic Provisions, a chocolate and praline croissant, and a gorgeous petit-four cake with five different colored cake layers. Finally, as I placed our order with the girl at the counter, she asked me if I was paying with cash or card. She winced. "Our card reader literally broke just a second ago — we're unable to take credit cards at this time." I swear to god, I almost cried. 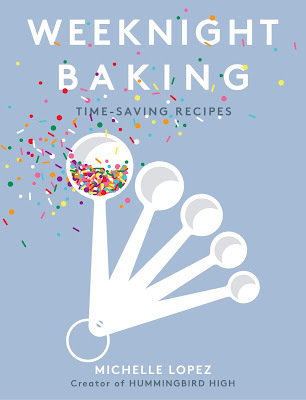 Later that day, as I was pastry-less and feeling dejected, I decided to torture myself further by flipping through Thomas Keller's highly-lauded baking cookbook, The Bouchon Bakery Cookbook. The cookbook offered pages and pages of delightful recipes for French pastries like croissants, gougeres, and brioche buns. It was tempting to just roll up my sleeves and attempt one of the recipes — unforunately, upon further inspection, almost all of them needed a lead time of about a day (most of the pastry recipes used a pre-ferment starter for its dough). 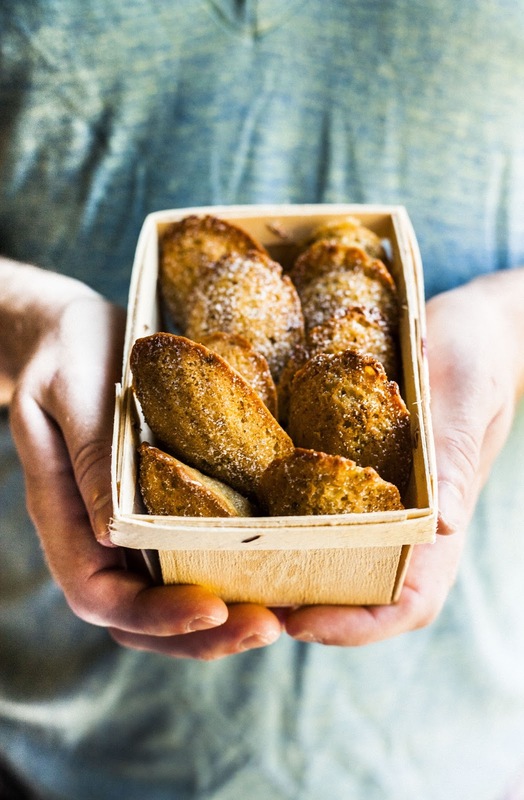 What are madeleines? 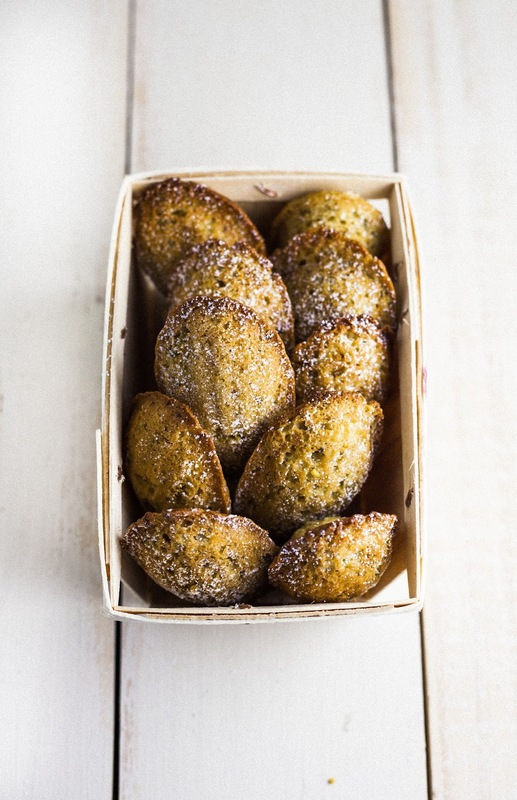 Madeleines are little French sponge cakes in the shape of sea shells. They're about the size of cookies, but their texture is definitely more cake-like than cookie-like. Most are flavored with lemon, and almost all madeleines have a signature little "bump" on their backs (which you can see in the picture above). They were the perfect baked good to satisfy my craving for a French pastry — extremely buttery, with a slightly crispy exterior and a soft cakey inside. I'd made madeleines before, but neither were perfect. My first batch, although supremely buttery and delicious with a delicate orange flavor, didn't have the miniature bump that bakers seek. My second batch, a more traditional brown butter and honey recipe, didn't have the right texture — while they tasted good, the picky baker in me declared them a little too "cakey". Thomas Keller's recipe was a good compromise between the two — it had a crispy, substantial exterior with a soft, spongey inside. The madeleines were flavored with a pistachio paste that gave the madeleines a wonderful, nutty flavor and a slightly coarser texture that was absolutely delicious. My only complaint with the recipe was that the madeleines were definitely the least photogenic of the other recipes I've tried — they definitely have a rough, rustic look about them, am I right? Oh well. I blame it on the pistachio paste. Feel free to use green food coloring to tint the madeleines a pistachio green; however, I chose to leave mine free of artificial colors to stay true to the rustic French aesthetic. This recipe requires you to refrigerate the batter overnight; plan accordingly! Ordinarily, my recipes use large eggs, but this recipe calls for a jumbo-sized egg. For non-US readers, your egg should weigh around 69 grams out of its shell, whisked. This recipe uses pistachio paste, which, truth be told, is a bit of a pain to find. You can get it online at Amazon, but it's definitely on the pricier side for an ingredient. If you've got a food processor, I suggest googling a recipe to make homemade pistachio paste. As I stated above, if you want your madeleine to have a vivid green color, feel free to add a couple drops of green food coloring. In a medium bowl, whisk together 1/4 cup plus 2 1/2 tablespoons all-purpose flour, 3/8 teaspoon baking powder, and 1/8 teaspoon kosher salt. Set aside. In the bowl of a freestanding electric mixer fitted with a whisk attachment, combine 1 jumbo egg and 3 tablespoons plus 2 teaspoons granulated sugar. Mix on medium-high speed for about 1 minute, before increasing the speed to high and whipping for about 4 minutes, until the batter lightens and doubles in volume. While the egg and granulated sugar is whipping, heat 4 tablespoons unsalted butter, 2 teaspoons dark brown sugar, and 1 1/8 teaspoons clover honey in a small saucepan over medium-high heat, whisking constantly to dissolve the brown sugar. This should take around a minute; once the sugar has dissolved, remove from heat. Remove the bowl from the mixer stand (from the 2nd step) and use a rubber spatula to fold in half the dry ingredients (from the 1st step); then, fold in the remaining dry ingredients until just combined. Scrape the bottom of the bowl to incorporate any dry ingredients that may have settled there. Pour the warm butter mixture (from the 3rd step) over the batter ad fold until the mixture is incorporated and the batter is smooth. Place 3 tablespoons pistachio paste in a medium bowl — if the pistachio paste is very stiff, warm in the microwave for about 20 seconds to soften. Use a rubber spatula to stir one-quarter of the batter into the pistachio paste to lighten it, then fold into the remaining madeleine batter. Place the batter in a covered container and refrigerate overnight. 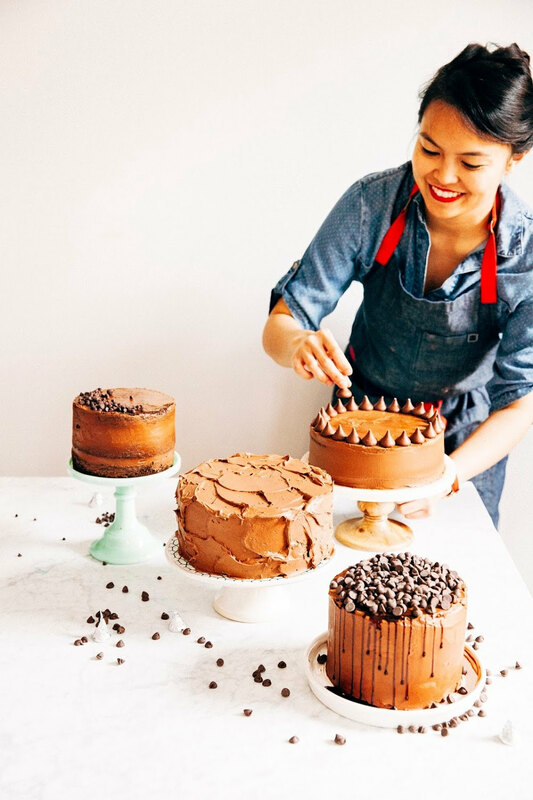 Once the batter has chilled overnight and you're ready to serve the cakes, preheat the oven to 350 (F). Prepare your madeleine pan by spraying generously with cooking spray. Spoon the refrigerated batter into the madeleine pan using a 1-tablespoon cookie scoop — I filled each cavity with 1 generous tablespoon of batter. Tap the bottom of your madeleine pan against your work surface to smooth the top of the batter. Bake for 8 to 9 minutes in the preheated oven, or until the tops are lightly browned and a skewer inserted in the center of a madeleine comes out clean. The bottoms of the madeleines will brown more quickly than the tops, so keep the tops on the lighter side. 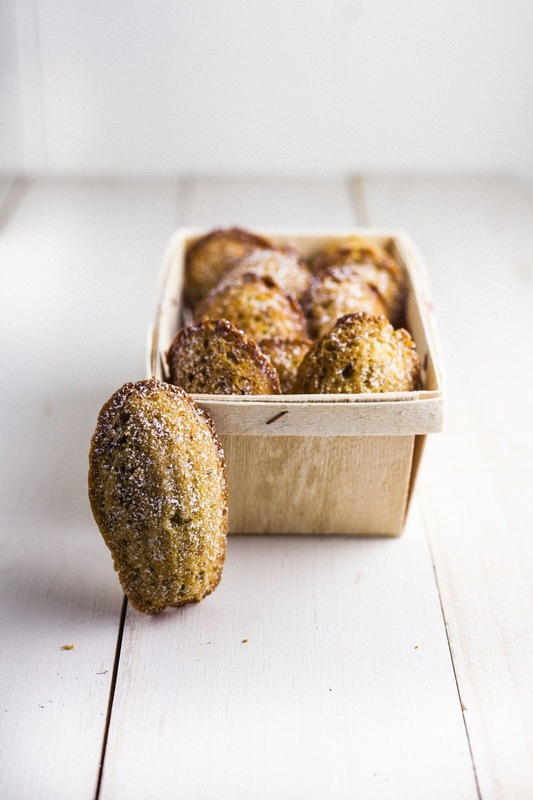 Immediately unmold the madeleines and cool on a cooling rack. My heart broke a little reading the first part of this post. 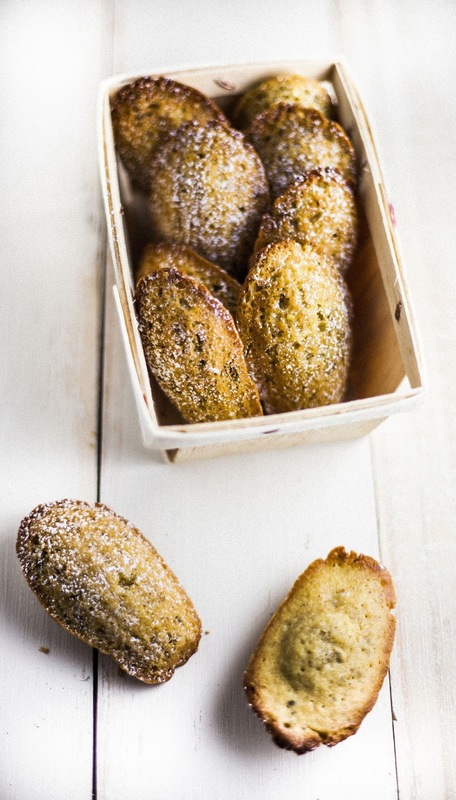 Glad you were able to make those beautiful madeleines! Gorgeous! I have such a soft spot for madeleines and I really love your photos in this post - they're making me so hungry! YUM! I used to eat these smeared with lemon curd as a kid. I bet that would be perfect. I love your photography Michelle, it's beautiful. I also love reading each of your posts and hearing about the places you visit. I wish we had more bakeries here in the UK like you do over there, all the places here that sell baked goods seem to be big companies like Starbuck's for instance. These madeleines sound delicious, I haven't some in ages. This happen to me today! All the credit cards and internet banking were down... I did get order a box of bagels from a sydney bakery.... CRIES I feel you. These are so wonderful. I still have get this book. From all the recipe you adapt from it, it must be good.